Trucks wait to enter the United States at the border crossing in Tijuana, Mexico, Feb. 2, 2017. More than $1.6 billion in goods flow across the border each day. Frustrated by the large number of Central Americans who've been crossing the border from Mexico, President Trump has threatened to take dramatic action. "If they don't stop 'em, we're closing the border," Trump warned Friday. "They'll close it. And we'll keep it closed for a long time." 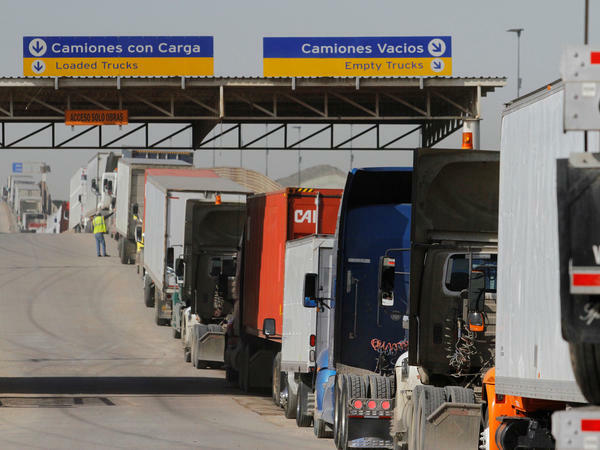 Halting cross-border traffic with one of the nation's biggest trading partners could do serious damage to the U.S. economy, including industries located far from Mexico. Retailers in San Diego got a small taste of that last November, when members of a migrant caravan charged the border and U.S. officials closed one border crossing in response. While that shutdown lasted only a few hours, it came on what should have been one of the busiest shopping days of the year. And the fallout was severe, costing local merchants an estimated $5.3 million in lost sales. Saloumi said if the border were closed for a full week, he'd be out of business. "That mall would be a ghost town," he said. U.S. assembly plants are especially dependent on Mexico for some critical parts such as wiring harnesses. Without them, those plants would soon grind to a halt. And that in turn would idle domestic parts makers.